Recent changes to planned improvements to Route 1 in Alexandria threaten to force the closure of Woodlawn Stables -- the largest and one of the last public equestrian educational and boarding facilities remaining in the area. The former widening-in-place proposal would have less impact on Woodlawn Stables and the historical, cultural, environmental and architectural qualities of the Woodlawn Historic District than the bypass alternative proposal. There are several structures on the Woodlawn Stables property that are contributing historic structures to the Fairfax County Woodlawn Historic District, and the National Register District. These include the Sharpe Barn Complex (built in 1912) and the Otis Mason house (built in two stages with the first portion being built circa 1854). Woodlawn Stables has provided a long and proud equestrian heritage to our area. Under this name, the stables have served the community as an equestrian facility for more than 61 years; it has been under its current incorporation as a teaching and boarding barn for more than 33 years. The property has been a farm and equestrian facility for over 150 years. Woodlawn Stables operates on land leased from the National Trust for Historic Preservation (NTHP). The NTHP is supporting the bypass proposal that inflicts greater damage and impact to the integrity of the entire National Historic District’s setting and viewshed over the widening-in-place proposal. After moving forward with a new bypass alternative to the Route 1 construction plan, the Federal Highway Administration (FHWA) and the NTHP failed to notify Woodlawn Stables of the new proposal or how it would adversely effect the business. Furthermore, due to a lack of transparency in the environmental assessment process, the public had now way of knowing that community institutions such as Woodlawn Stables and its surrounding historically significant structures was endangered except through documents posted on the FHWA website months after it was proposed and at the end of the Environmental Assessment process. Save Woodlawn Stables supports the widening-in-place proposal and believes that Rt. 1 improvements must include balanced development and solutions that consider the well-being of our entire community. Woodlawn Stables, as we currently know it, is a locally female-owned and operated family business that has been servicing horse enthusiasts for 33 years. The 56-stall barn is the largest equestrian facility in the area and is one of the only area stables that provides both public lessons and boarding services. Woodlawn Stables and the historic property on which it is located have a long and proud equestrian heritage and relationship with the community. Woodlawn Stables is located on a 56-acre portion of the Woodlawn Plantation Historic District in Alexandria, Virginia. The Stables leases the 56-acre horse farm from the National Trust for Historic Preservation as one portion of the Woodlawn Mansion and its 127 acres of historic property. These storied grounds have been used as a farm for over a century, and have provided equestrian activities and events enjoyed by the public for over 61 years. The property is also home to a vast array of wildlife – deer, fox, wild turkeys, bald eagles, bluebirds, ground hogs, turtles. Many other animals are spotted at the stables on any given day. Woodlawn is currently home to about 50 horses; some are privately owned and can be relocated by their individual owners, but many of the senior horses would face an uncertain future. These horses are not “desirable” to those who don’t know them – a little faded, a little slower, but fiercely loved by the Stables. These are the horses that have worked in the school for years, or even decades. At Woodlawn Stables, horses that have earned the title of “school horse” are rewarded with a lifelong spot in the herd, guaranteeing them a life of quality care. Once retired due to age or injury these horses are not sold or traded for younger horses, but live out their days on the grass with the horses and people they know. If the barn is destroyed there are many horses that, after giving a life of service to the community, will have nowhere to go. These would not be easy animals to re-home – horses are expensive to care for and not many are willing to give the money and resources to a horse that cannot be ridden. Woodlawn Stables is, of course, a business, but they have also made it their business to give their horses a life of love and care – even when they are no longer beneficial to their bottom line. That is the nature of Woodlawn Stables. The preservation of Woodlawn's equestrian farmland and structures, as part of the Woodlawn Plantation’s Historic District, has allowed these properties to serve multiple audiences within the community. One would be hard pressed to find a local that didn’t ride at the stables, know someone that rode at the stables or has simply enjoyed the view of the horses grazing the green open fields. The stables have provided over three generations of young people and adults a unique historical environment to experience the same farm life that has survived through the many eras of Woodlawn’s honorable past. Children have not only learned the essentials of equitation but the responsibilities of caring for large animals and the environment, something not widely available outside of rural areas. It is a suburban oasis of sorts – country life in our busy backyards that provides a wholesome, recreational gathering place for children and teens that promotes hard work and self- esteem to our young community. There are no other park facilities or undeveloped land in our area that can provide the same kind of outdoor recreation for our community’s children. Many adults and children from all over Fairfax County and neighboring communities take lessons or board their own horses at Woodlawn Stables. The stables’ 300-400 students also consistently infuse revenue into the surrounding area businesses as well – the restaurants, gas stations, retail stores and service industries all draw new customers from Woodlawn Stables’ patrons. The loss of Woodlawn Stables would significantly harm the local economy. The Federal Highway Administration (FHWA), in cooperation with other state and local agencies and invited interested parties in the Woodlawn area, are currently in the final stages of preparing the final environmental assessment report for improvements to Route 1. Documentation of recent private meetings between consulting parties reveal they are now favoring a detrimental bypass proposal that divides the Stables property and facilities, removes historically significant buildings, destroys existing pasture, barn and riding facilities – making it nearly impossible for the Stables to run in the manner it has for years as a riding school and boarding facility. Unfortunately, this comes as a surprise to many residents, admirers and users of Woodlawn Stables. This proposal has never been offered or discussed in the public scoping and informational meetings that were held as part of the public process of the Environmental Assessment. The FHWA never notified the owners of Woodlawn Stables of the bypass proposal, or that it would adversely affect the integrity and use of the Stables’ property and their business; FHWA also did not invite the owners of stables to be a consulting party in the Environmental Assessment process. Save Woodlawn Stables believes this is a violation of the letter and spirit of the Section 106 review process. Despite Woodlawn Stables having a long-term successful relationship with the National Trust for Historic Preservation, the Trust also did not inform the stables of the bypass proposal, or invite them to participate in the private consulting parties meetings. We citizens fear that given this treatment to their own long-term Lessee of the property, that the Trust also disregards what Woodlawn Stables means to the surrounding community. Woodlawn Stables, boarders, students and their parents, and the community are aware that the widening of Route 1 would bring some changes and sacrifice to the property and stables, as we know it. As concerned citizens we attended the public meetings, listened to the information provided, and were willing to accept changes to Woodlawn and the Stables based on the widening in place proposals presented to us. As more information emerges on the level of permanent destruction and adverse impact the bypass proposal will have on not only the Stables, but also Woodlawn as a National Historic Landmark, we have grave concerns as to why the National Trust for Historic Preservation is supporting the bypass and claiming it has less impact than the widening-in-place proposal. We hope that the NTHP will continue its mission to preserve this historic land and the rich history that it has fostered as part of the community. In essence we believe that the Stables and horses are as much a part of our area’s unique treasures as the rest of the grounds of Woodlawn Plantation and need not be sacrificed if there are more viable alternatives to consider. In order to represent the views of many people in the Mt. Vernon community we have organized a grassroots movement called “Save Woodlawn Stables.” It is comprised of a group of local community volunteers that feel the need to take action before it is too late. We are community members who cherish the presence of Woodlawn Stables and believe we are far from alone based on the thousands of supporters our petition, on-line presence, and media efforts have garnered. At Save Woodlawn Stables we agree that substantial improvements are needed to address Route 1’s current and anticipated traffic issues. We believe that these improvements must include balanced development and solutions that consider the well- being of our entire community. Our situation is unique, given that the Trust - one of the primary property owners in the area - is also the owner of the Stables property. We in the community have always placed our trust in the NTHP, believing that they would always act on the behalf of the entire historic property of Woodlawn Plantation, its sprawling grounds and how it serves many of our community’s needs and goals. It is our belief that the Environmental Assessment process has failed to properly inform the public of all relevant considerations so that they may appropriately respond, share their concerns and take a more active role in decision-making process. 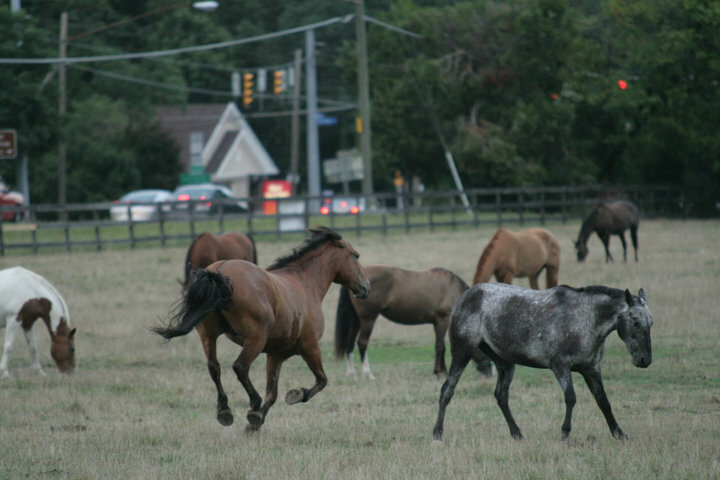 We suspect that the NTHP and Federal Highway Administration are aware that there is broad public support for Woodlawn Stables and maintaining the land as open space for equestrian purposes, so we question the timing of the introduction of such a detrimental proposal at the end of the process, after the previous public meeting stages were complete. We come together now determined to preserve an iconic and treasured part of the Mt. Vernon community. The herd at Rt. 1. They'd miss Woodlawn. Wouldn't you miss them?